How Do Birds Migrate Correctly? Without an atlas, road signs, or GPS, more than 5,000 species of birds manage annual round-trip migrations. These journeys can be thousands of miles, with many birds often returning to the exact same nesting and wintering locations from year to year. But how do birds manage this amazing journey? Understanding how birds migrate can give birders even greater appreciation for the birds they see each season. Migration is critical in the life cycle of birds, and without this annual journey many birds would not be able to raise their young. Birds migrate to find the richest, most abundant food sources that will provide adequate energy to nurture young birds. If no birds migrated, competition for adequate food during breeding seasons would be fierce and many birds would starve. Instead, birds have evolved different migration patterns, times, and routes to give themselves and their offspring the greatest chance of survival. Of course, not all birds migrate. Some species have adapted to take advantage of different food sources as seasons change, allowing them to stay in one location all year round. Other birds are better adapted to cold climates with thicker fat reserves and better feather insulation, and they can survive long cold seasons while they forage for winter food. For more than half the world's birds, however, migration is essential to stay alive. While these factors may affect migration by a day or two, most bird species follow precise migration calendars, but those calendars vary widely for different species. While fall and spring are peak migration periods when many birds are on the move, migration is actually an ongoing process and there are always birds at some stage of their journeys. The distance the birds must fly, the length of time it takes to mate and produce a healthy brood, the amount of parental nurturing young birds receive, and the location of birds' breeding and wintering grounds all affect when any one species is migrating. One of the greatest mysteries of migration is exactly how birds find their way from one location to the next. Scientific studies have been done on a number of bird species, and several different techniques of bird navigation have been discovered. Magnetic Sensing: Many birds have special chemicals or compounds in their brains, eyes, or bills that help them sense the Earth's magnetic field. This helps the birds orient themselves in the right direction for long journeys, just like an internal compass. Geographic Mapping: Because birds follow the same migration routes from year to year, their keen eyesight allows them to map their journey. Different landforms and geographic features such as rivers, coastlines, canyons, and mountain ranges can help keep birds heading in the right direction. Star Orientation: For birds that migrate at night, star positions and the orientation of constellations can provide necessary navigation directions. 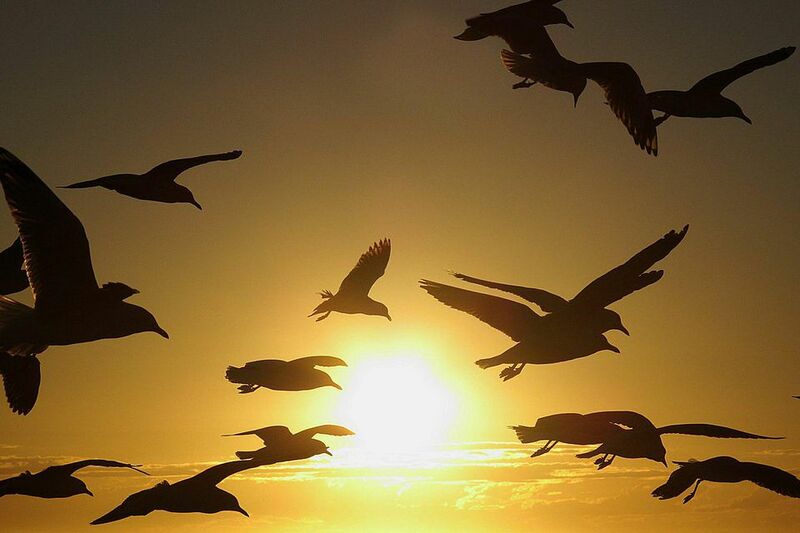 During the day, birds also use the sun to navigate. In addition to these major navigation techniques, birds may also use other clues to find their way. Strong scent clues for different habitats, ambient sounds along their routes, or even taking clues from other species with similar needs can all help birds migrate successfully. Migratory birds have several physical adaptations that allow them to safely migrate long distances. As daylight changes and migration times near, a bird's hormone levels will change and they will build a greater fat supply to provide extra energy for their travels. A ruby-throated hummingbird, for example, can nearly double its body fat just a week or two before migration. This process of migration-related weight gain is called hyperphagia, and many migratory birds experience it. When a bird molts to a new plumage can also be related to migration. Old, ragged feathers create more wind drag and air resistance, which requires a bird to use more energy in flight. Many birds molt just prior to migration to take advantage of more aerodynamic feathers that make flight easier and more efficient. Birds also change their behavior during migration to make the journey safer. Many birds fly at higher altitudes during migration than they would for shorter flights, for example. Wind patterns higher up help push them along and the cooler air keeps their bodies from overheating due to exertion. Birds that are normally diurnal, such as most songbirds, change their behavior to fly at night when there is less risk of predator attacks from migrating raptors. The more birders are aware of the threats that jeopardize successful bird migration, the better they can take steps to help birds complete their journeys safely. Keeping bird feeders full at peak migration periods, taking steps to prevent window collisions, turning off outdoor lights, and keeping cats indoors are all easy steps that can help migrating birds. Migration is a dangerous but necessary journey for many birds. Fortunately, they are well equipped to survive the task and bring winged enjoyment back to birder's yards year after year.